The earth desolate and empty, but permeated by nomadic structures. Like wild growth in destroyed architecture newly built residential nests, honeycomb, in red and green light, all hope is not lost, sunrise is imminent - or is it just sunset? 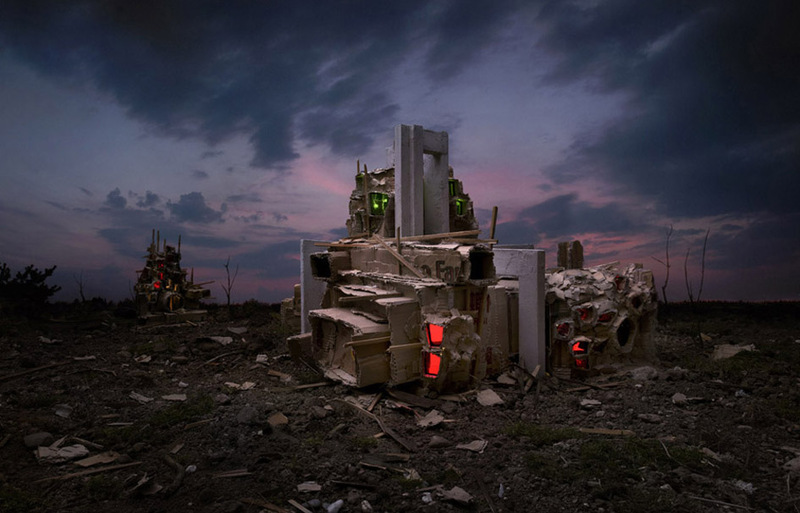 ... "Aftermath" is a photo work of the Dutch artist Rob Voerman, showing the complexity of his work with architecture, civilization and its utopias. In models, photographs, drawings, prints, sculptures and installations, Voerman's plans and models of Modernism are Le Corbusier, Frank Lloyd Wright, Gerrit Rietveld, Ludwig Mies van der Rohe and the Bauhaus. In particular, he is concerned that the great plans, the visions and utopias of this epoch seem no longer to bear today. But where is the believe in the future, which modernity has always expressed in its opinions?